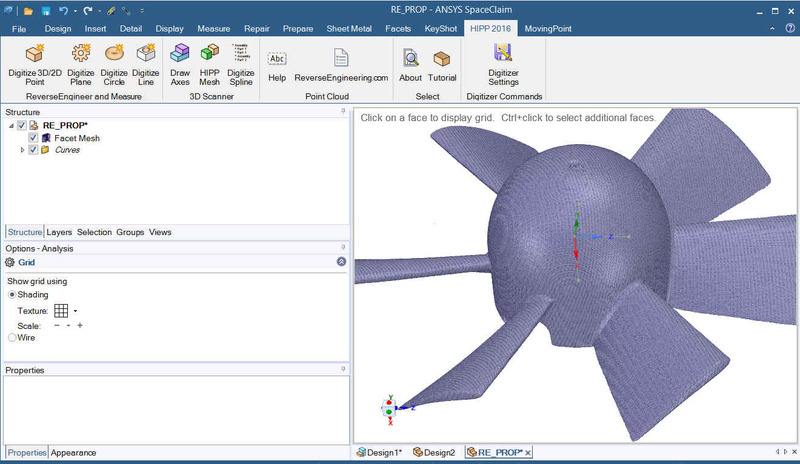 ReverseEngineering.com announced today that its HIPP 2016 integrated point cloud tools are now available for ANSYS® SpaceClaim® and ANSYS® SpaceClaim® Direct Modeler™. “HIPP 2016 is providing a valuable tool to SpaceClaim's reverse engineering workflow. The tight integration of various scanners provides a powerful front end for data capture into SpaceClaim," said John Graham, ANSYS SpaceClaim Marketing Manager. HIPP for SpaceClaim supports direct scanning input from a wide range of 3D scanners, including FARO HD scan arms, Romer Absolute SI scan arms, Kreon Baces, Microscribe HDI LMI blue and white light scanners. Hard probing features include Live tracking probe on screen for probe measuring planes, points, lines, splines, circle and section profiles in the SpaceClaim environment. Easily capture and model prismatic parts instead of the laser scanning mesh method. The easy to use workflow allows for probe compensation of measured diameters. The digitize by time and distance settings can be set for more control of data capture. Live “Spray Mesh” feature allows the real time scan data to appear as a ready to wrap mesh surface in SpaceClaim. ReverseEngineering.com. Headquartered in La Jolla, California, is the leading company dedicated to direct CAD reverse engineering and measurement software solutions worldwide. Founded in 1995, ReverseEngineering.com develops and markets 3D scanning software tool sets that accurately, quickly, and easily manage digitized data from portable and traditional CMMs, laser trackers, and laser scanners into CAD/CAM systems as easily modifiable parametric sketches. Providing what is essentially a universal front end for reverse engineering, we have eliminated the data translation issues usually associated with reverse engineering and related applications. ReverseEngineering.com is an Ansys SpaceClaim partner, PTC Silver Partner, Autodesk Inventor certified partner, Solidworks Certified Gold partner, MasterCam, Kubotek, and SIEMENS solution partner. Customers include PENSKE Technology Group, GE Healthcare, U.S. Army Special Forces, Los Alamos Labs, U.S Air Force and the U.S. Navy. HighRES, Inc dba ReverseEngineering.com is privately held. Visit www.ReverseEngineering.com for more information.